Chalk Ranch is a luxury five-star Coastal Mountain Executive & Corporate Retreat venue that promotes team-building and nurturing relationships. Our emphasis is on creating experiences in a beautiful & private natural setting. We offer two types of venues to achieve this goal. The Executive Retreat offering is designed to host senior executives and other leaders in their respective fields who desire an overnight venue. The lodge’s spacious floor plan, allowing several conference and dining options, the finest mountain home craftsmanship, five star resort amenities, and a relaxing, intimate ambiance is the perfect setting for building or renewing relationships with colleagues, customers, partners and peers. > Transaction celebrations like IPOs/M&A. > Personal time to unwind, contemplate the future. In a recent Forbes article titled “A Corporate Retreat Survival Kit”, award-winning journalist Deborah Jacobs noted that “my fantasy retreat involves a cup of coffee and a bunch of comfy couches in front of a fireplace where my colleagues and I can have a meaningful discussion. I promise you, I will come to know them better”. This is an example of what the Chalk Ranch Executive Retreat is all about. The Corporate Off-Site offering is designed to achieve the same objective but in an activity-rich team building environment. This offering typically is a gathering of corporate teams for the day and is focused outside on the ranch’s 50 acres, but with use of certain parts of the lodge. For day events with presentations or dining, the deck and terraces can accommodate a larger number of people. Whichever best suits your needs, or some combination of both, you’ll enjoy the ranch’s unique, secluded location. Nestled at the base of the Santa Cruz Chalk Mountains, overlooking An᷉o Nuevo Island and the Pacific Ocean, the Ranch Executive & Corporate Retreat is located along a strip of California’s most pristine coastline. Clear star-studded night skies, sunny days, fresh air, magnificent sunsets, and beautiful vistas are noteworthy in this area. The Ranch is centrally located in the California Bay Area- San Francisco, Pebble Beach, the entire Peninsula and both airports are all within a 45 mile radius. Half Moon Bay and Santa Cruz are even closer. When outside the urban areas, traveling to the Ranch is scenic and stress free. Death by powerpoint in a windowless bunker – not for these guys. 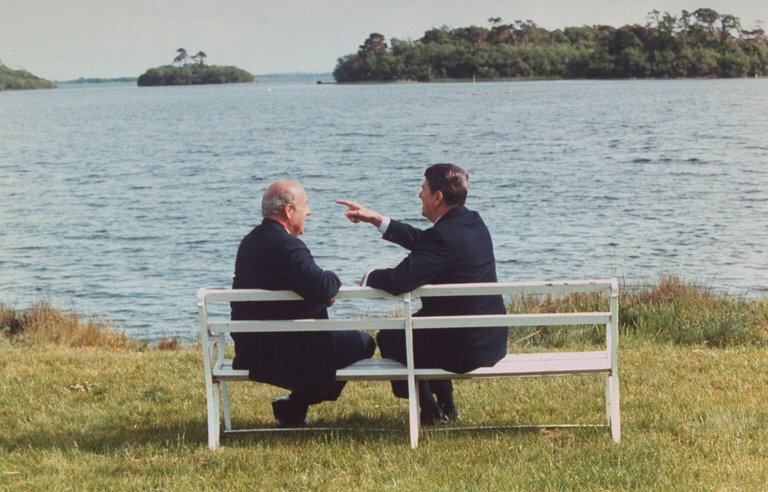 President Reagan and Secretary Schultz enjoying themselves while nurturing their relationship. Whether enjoying the warmth of a roaring fire, refreshing hikes in the surrounding area, a game of bocce, or lounging on the deck, the Ranch offers a wealth of ways for people to connect. “I came to Chalk Ranch with my leadership team and it was a wonderful experience. The location is just far enough away to feel like a true offsite but not so far away that it was inconvenient. The lodge is beautiful, spacious and luxurious. The interior meeting rooms were very comfortable, though I highly recommend getting the whiteboard out by the Adirondack chairs with ocean views. The kitchen is fantastic and we enjoyed cooking together. Relative to staying at a hotel, this was far more memorable and gave us many more hours of productive working and bonding time. We’ll definitely be back.” – Mac S.
If you are looking for a secluded, private venue in which to meaningfully engage with others, the Ranch offers an unparalleled opportunity to reach that goal. Chalk Ranch Executive & Corporate Retreats is an experience you won’t soon forget. Come visit us soon!